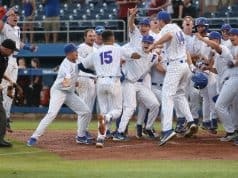 The Florida Gators’ dominance over Florida State and the winningest coach in college baseball history continued in Jacksonville on Tuesday night. After falling behind 1-0 and then again 2-1 the Gators clawed their way back to a 4-2 win over rival Florida State. 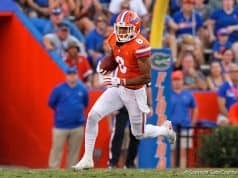 The win is the Gators’ 10th consecutive — extending a school record — and their 16th win in the last 18 games against the Noles. With two losses on the year Mike Martin’s overall record against the Gators dropped to 76-76 all-time with one more game to go. 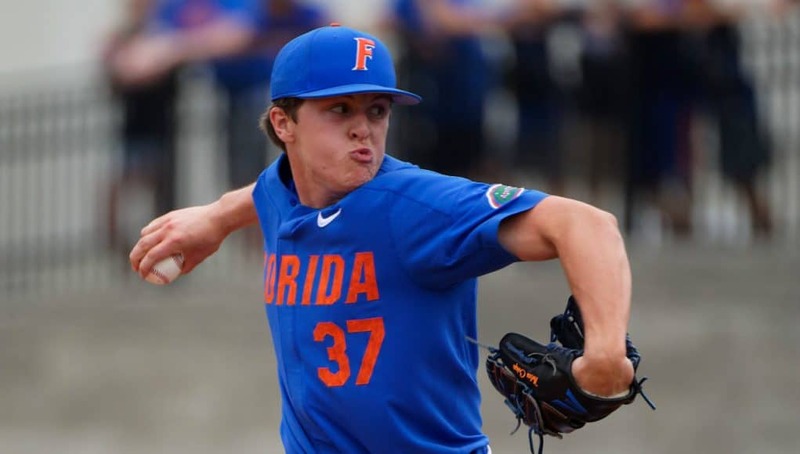 Nolan Crisp had worked his way into the role of Florida’s closer — a lack of save opportunities kept him in the bullpen — so Kevin O’Sullivan moved him into a weekday starter spot. Crisp picked up a win last Tuesday over Jacksonville but facing FSU is a different animal. Pitching in front of the largest crowd of his life freshman Nolan Crisp rose to the occasion. Florida gave Crisp run support in the fifth inning. Jud Fabian reached on a walk and scored when Austin Langworthy sliced a ball down the left field line. Fabian scored with ease and Langworthy strode into second standing up. Brady Smith executed a perfect sacrifice bunt but the Gators left Langworthy stranded on second. Florida State finally got to Crip in the bottom of the sixth inning. Crisp walked Matheu Nelson to start the inning and Mike Salvatore crushed a two-run home run to right field to give the Noles a 2-1 lead. Another single chased Crisp from the game, replaced by Jordan Butler on the mound. Butler walked the first batter he faced, so now the Gatos faced a two on, no outs situation without the lead. “It was great to come into a big situation and get a big out,” Scott said. 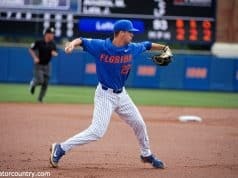 Florida answered in a big way the very next inning, aided by a couple of FSU errors that always seems to creep up when they’re playing the Gators during this 10-game winning streak. Jud Fabian worked a one out walk but Langworthy struck out and Mike Martin went to his bullpen. Brady Smith reached on a fielding error. Jacob Young squibbed a ball off the end of his bat that forced the second baseman to charge in. Young’s speed was going to make the play tough and Salvatore knew it. He tried to make a flip with his glove all in one motion after fielding the ball but it sailed over Nico Baldor’s head allowing Fabian to tie the game. Brady McConnell laced a ball over the center fielder’s head one batter later to plate two and open the game up 4-2. Christian Scott took over the rest of the game and the freshman was lights out. Scott would go on to earn the second win of his career. The Gators will get a couple of days off before hosting the Alabama Crimson Tide at McKethan Stadium for a three game series this weekend.